Day one of the Woolworths Surfer Groms Comps Series presented by Pic’s Peanut Butter saw a day filled with exciting surfing in small waves with champions crowned across the younger age divisions. Cruz Air (Thirroul) showed all the makings of a future champion, taking out the Under-8 Mixed division. Air shone in the glassy peaks, performing a variety of decent turns to post a 6.33 wave score, which allowed him to gain the upper hand against his opposition and take the victory. 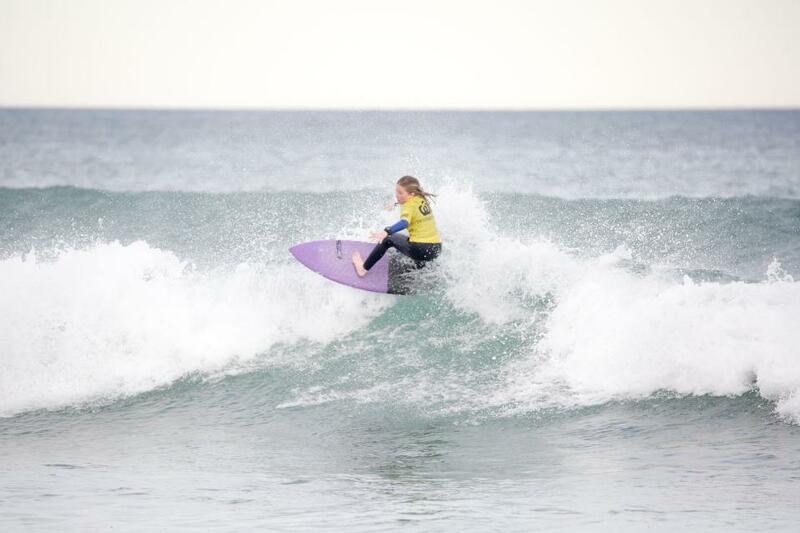 Evie Fisher (Gymea Bay) and Lucy Darragh (Gerringong) went neck-and-neck for the title in the Under-10 Girls with both surfers revelling in the punchy waves, however, Fisher was able to gain the edge in a countback situation thanks to posting a decent 6.27 wave score. Ruby Trew’s (Seaforth) ability to conjure up solid scores paid dividends as she nailed an excellent 8.83 wave score in the Under-12 Girls. Trew claimed the victory ahead of Tiana Darragh (Gerringong). Oceanna Rogers (Shellharbour, NSW) took out the AirAsia Wave Of The Day for a near-perfect 9.0 wave in the Under-14 Girls. Ocean Lancester (Merewether) took out the Woolworths Fresh Wave Award for an impressive 15.5 two-wave heat total in the Under-10 Boys division. Tiana and Lucy Darragh and Henry Smith (Mona Vale) all took out Pic’s Peanut Butter Performer Awards for their respective day one performances. Day two of the Woolworths Surfer Groms Comps Series presented by Pic’s Peanut Butter will reconvene tomorrow. Regarded as one of the major stepping stones in the development of young Australian surfers, the 10-event Woolworths Surfer Groms Comps Series presented by Pic’s Peanut Butter caters for surfers from Under 8 to Under 14 and will be held in New South Wales, Queensland, Victoria, Western Australia, Tasmania and South Australia over summer. As an added bonus, the respective winners of the Under 14 boys’ and girls’ divisions from each event will receive an invite to attend an all-expenses-paid, three-day Woolworths Surf Camp at the Surfing Australia High-Performance Centre (HPC). For the South Australian, Victorian and Tasmanian events, the Woolworths Surf Camp prize will be awarded to the highest place Under-14 Boy and Girl who reside in that respective State. Specialty awards to be provided at each event include the Woolworths Fresh Wave (boy & girl), Pic’s Peanut Butter Star Performers (boy & girl) and AirAsia Air of the Day. Each entrant will also receive a Woolworths Surfer Groms Comps Series presented by Pic’s Peanut surfboard sock for entering. The Woolworths Surfer Groms Comps Series presented by Pic’s Peanut Butter has helped to launch the careers of many of Australia's most promising junior surfers with almost 800 children set to take part in the 2018/19 event series. For more information, visit Surfing Australia. The Woolworths Surfer Groms Comps Series presented by Pic’s Peanut Butter at Cronulla saw an action-packed finale today as competitors duked it out in tricky three-foot surf. In what was one of the best heats of the entire contest, the Under-14 Boys division went hell-for-leather in an attempt to claim the coveted title. Xavier Bryce (Mona Vale) and Dom Thomas (Swansea Heads) both posted excellent scores in excess of eight-points, however both were unable to find the backup scores necessary to take the title from Hughie Vaughan (Bateau Bay) who claimed the title with a 15.16 two-wave heat total. After a dominant performance yesterday, Oceanna Rogers (Shell Cove) was able to take top honours in the Under-14 Girls division. Rogers posted a respectable 12.77 two-wave heat total to take a win ahead of fellow event standout and South Coast local Keira Buckpitt (Culburra Beach) who posted 11.3. After taking out the Havaianas NSW Grommet Title a few months back, Fletcher Kelleher (Freshwater) continued his winning momentum, taking out the Under-12 Boys division. Kelleher executed an array of powerful forehand turns to post a 15.76 two-wave heat total and claim the win ahead of fellow Northern Beaches surfer Sol Gruendling (Queenscliff) who finished in the runner-up spot. Taj Air (Thirroul) put on an impressive performance in the challenging surf to claim the win in the Under-10 Boys division. Air posted a modest 9.13 two-wave heat total to take the victory ahead of Ben Zanatta Creagh (Dee Why). In other results, Isaac Brown posted a solid 9.07 wave score to claim the AirAsia Wave of the Day, while Ruby Rockstar Trew took out the Woolworths Fresh Wave Award for posting a 15.4 two-wave heat total. Speciality awards to be provided at each event include the Woolworths Fresh Wave (boy & girl), Pic’s Peanut Butter Star Performers (boy & girl) and AirAsia Air of the Day.